The Clock House provides spacious first floor self catering accommodation with stunning views westwards down the Langdale valley and northwards to Silver Howe. The Clock House is in the centre of the village, a few yards from the Britannia Inn and the bowling green. 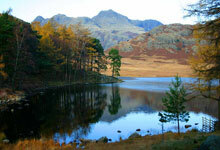 There is an abundance of walks, ranging from gentle to strenuous, from the doorstep. It was built for use by the family when the house was extended about 20 years ago, and has now become available for holiday use, following refurbishment. 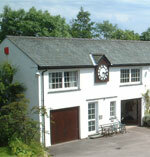 When the extension was built, the architect made provision for a clock to be incorporated into the building. As the antique clock itself came from a now demolished hospital, it does not of course strike the hours!